We've tried to answer the most commonly asked questions below but if you can't find what you are looking for please click the red Contact Us tab opposite. Do I need a passport or ID? No, the Isle of Wight is inside the UK and not subject to any border control. ID is required if you are claiming a concession discount or if you want to purchase alcohol and look under 21. Can I leave my car at your terminal and go as a foot passenger? Foot passengers are welcome on this service but unfortunately you cannot leave your car at the terminal. There is parking at the Triangle Car Park which is very near the terminal. Alternatively, you can try the car parking at the end of Town Quay or large multi-storey at Ocean Village. What happens if I can't print my eticket? Your booking number will be acceptable - just record it carefully and give it to staff at check-in. If you booked online or booked by phone against your customer number you will be able to login to your account using a Smartphone, retreive your booking and check-in staff will scan the barcode on your device. If youhave also entered your Vehicle registration number, your booking will be found automatically on arrival at our check-in booth. Can I make amendments to my booking online? Unfortunately you are currently unable to make amendments to your booking online, for amendments to bookings please contact our contact centre: Booking amendments: 023 8001 9192. Can I pay for a ticket on the day? Yes you can but this often proves to be more expensive if you are taking a vehicle and there is no guarantee we will have vehicle space onboard. Foot passenger pricing is the same whether you purchase on the day or in advance. What happens if I bring a different vehicle to the one booked? We don't need to know unless the overall length exceeds 5.5m, the height exceeds 2.0m, or the vehicle type changes (e.g. from a car to a van). Please include objects such as luggage racks and bike racks when calculating the length and height. What is the postcode of the port? How far in advance of departure do I need to arrive to check-in? At least 30 minutes before departure but not more than 60 minutes on peak dates. Can I show up before my booked time and get an earlier departure? Yes, subject to availability, but at busy periods this may not be possible and you may be asked to return in time for your booked crossing. Please call our Travel Centre for advice, on 023 8001 9192 and we’ll do our best to help. We will endeavour to get you on the next available sailing that has space. This may not be next sailing. How do I buy a ticket if your ticket offices are closed? Self-service ticket machines accepting cash and debit/credit cards are available for foot passengers. Can I stay in my car whilst onboard? No, although in very exceptional circumstances the Master of the ferry you are catching may give permission. Do you have baby changing facilities on board? Do you have disabled facilities onboard? Are dogs permitted on the car ferry? Can I take push bikes on your services? Yes, there is no additional charge for foot passengers taking bicycles. Please report to the foot of the linkspan, have your ticket ready and staff will direct you onto the main deck of the ferry when ready. Are we allowed to take our own refreshments onboard? Guests are welcome to take their own refreshments onboard however our catering team do offer a wide range of hot and cold food and beverages via our ReFuel and Steam Coffee outlets. Can I get a refund if I don't use my ticket? How do I recover lost property? Can we buy tickets online or in advance? Apart from through rail tickets, standard tickets are not yet available online. However you can buy 7 day, 30 day, 6 month & 12 month season tickets in advance and books of singles or day return saver tickets, some of which can be purchased online. Red Jet tickets can be purchased from the ticket office at Terminal 2 and West Cowes. See contact page for full details. No, the Isle of Wight is inside the UK and not subject to any border control. ID is only required if you are claiming a concession discount or if you want to purchase alcohol and look under 25. What are the postcode of the terminals? Unfortunately you cannot leave your car at the terminal. There is parking at the Triangle Car Park which is very near the terminal. Alternatively, you can try the car parking at the end of Town Quay or large multi-storey at Ocean Village. Long-stay parking is available in Park Road, Mornington Road and Brunswick Road. Short-stay parking is available in St Mary's Road, Cross Street, the Esplanade and The Parade. A Park & Ride facility is also available at Somerton on the A3020 - see the Bus section for more details. Coach parking is available in Ward Avenue. There are limited spaces in Fountain Yard for dropping off or meeting passengers - waiting time is restricted to 10 minutes and is enforced 24/7. How far in advance do I need to arrive at the terminal? Try to arrive at least 10 minutes in advance of the departure time. How do I get a ticket if your ticket offices are closed? Self-service ticket machines accepting cash and debit/credit cards are available at the terminals. All of our vessels cater for disabled customers and have disabled access. Unfortunately due to limited luggage space we can only accept a maximum of two suitcases per person (no sails or sail boards) and 1 peice of hand luggage. Larger quantities or bigger items can be carried on the Vehicle Ferry parcel service provided by our partners Acclaim. Can we take our dog on the Red Jet? Due to space restrictions, you can only take fold up bikes on the Red Jet service provided they fit into to a carry bag. Can you buy drinks/refreshments onboard? Yes, we have a selection of snacks and hot & cold soft and alcoholic beverages served onboard. There are also Steam Coffee Company outlets at Terminal 2 on Town Quay (Southampton) and Fountain Yard (West Cowes). Toilets are available at both Red Jet Hi-Speed terminals and on board Red Jet 4, Red Jet 6 and Red Jet 7 (in service summer 2018). Visit the Ticket Office at West Cowes or Terminal 2, Town Quay, Southampton or call us on 02380 019192. How do I book The SUN offer? Sun bookings can be made online or via the Travel Centre but customers must be in receipt of a unique voucher code which is printed in Red Funnel's Travel Voucher leaflet, issued to you by the holiday park. Note: To book please go to the web address printed in the leaflet. It is not possible to enter the voucher code into the Promo/Offer code box on the vehicle ferry booking form. How do I book using a Promotion Code? If You have a promotion code you can enter it in the 'Promotional/Offer Code' field which can be found in the Express Booking area on the site Home Page or on the first page of the booking process - click on the orange 'Book Online' tab and follow the links. When a valid code is entered the prices returned will reflect the applicable discount. Note: If you have a SUN voucher code you must go to the web address printed on the ferry leaflet issued by the park. Yes. Most vehicle fares incur a £5 administration fee when booked by phone or in person. It is also more expensive to book on the day of departure. Do you use price comparison websites? No, we don't work with any public ferry booking portals or price comparison websites. 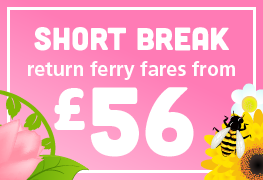 Our best fares are reserved for customers who book direct with us online. Is there a fuel surcharge on top of the quoted fare? No, the fares shown include an allowance for fuel. The price you see is the price you will pay. Do you charge extra if paying by credit card? No, there are no hidden charges; the price you see is the price you pay regardless of the type of debit or credit card used. Can I make an online booking for several vehicles at the same time? Not at present, this is something we will offer in the future. In the meantime, please make separate bookings for each vehicle. Is it possible to amend or cancel a booking online? Not yet, the ability to do this will be developed in the future. In the meantime, please call our Contact Centre on 023 8001 9192. How do I obtain my ferry ticket? An eTicket is issued for all ferry bookings made online or by telephone (this document also acts as a confirmation for non-travel items). eTickets will be sent automatically to the email address you provide when booking. If for some reason you do not receive it please email your booking reference number and correct email address to post@redfunnel.co.uk and we will resend it. Alternatively, quote your booking reference number at check-in when arriving for your booked sailing (note: check-in will take slightly longer). How do I collect my attraction admission tickets? 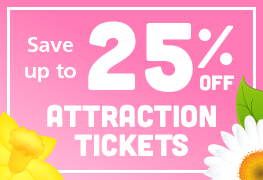 If purchased online (must be part of a vehicle or foot passenger booking), vehicle customers will receive their attraction tickets on arrival at check-in. Foot passengers should go to the ticket office at Terminal 1 to collect them. Does it matter if I don't arrive for my booked sailing? If arriving early and wishing to travel on an earlier sailing, a booking amendment fee of £5 is payable if you purchased a Saver ticket for this leg of your journey (does not apply to Flexible ticket holders). Additional charges may also apply if changing to a more expensive crossing. If you miss your booked sailing and have notified us in advance, a £5 booking amendment fee applies if travelling on a saver ticket (Flexible ticket holders are exempt). Additional charges may also apply if changing to a more expensive crossing. Q. How do I book a return car crossing + a trailer in one direction only? Do blue badge holders get a discount? Can I pay for a booking using a cheque or euro's? No, unfortunately we do not accept cheques or euro's as payment methods. Can I travel outward with Red Funnel and return with someone else? There are no joint ticketing arrangements in place but it is possible to make a booking for a single vehicle journey at little over half the price of a return ticket. Foot passenger tickets on the Red Jet service (Southampton<>West Cowes) are valid on the Southampton<>East Cowes service. Tickets purchased for the latter can be upgraded for use on the Red Jet service. What discounts do you offer frequent travellers? There is a wide range of options available for vehicle customers and foot passengers, including students. Please click here for more details. Is it possible to make an open booking? No, unfortunately this is not available at present. However, if you purchased a Flexible ticket for your return journey, no amendment fee's apply. (note: you may have to pay the fare difference if changing to a more expensive sailing). Can I travel without a vehicle using a vehicle ticket? No, it is not possible to buy say a vehicle day return ticket (including driver), travel in one direction with the vehicle and return as a foot passenger using the same ticket. A separate single foot passenger ticket is required for the foot passenger leg of the journey. 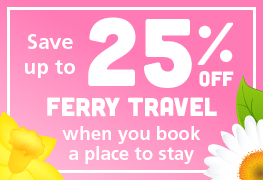 I have a voucher code for ferry travel, can I use this to book online? 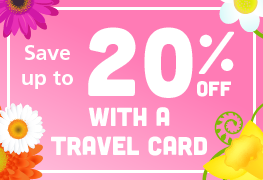 If you have a voucher, discount or promotional code which is valid, then this can be used on our website, provided it is valid for your dates of travel, duration of travel and you have the printed voucher (if stated). Simply enter this in the 'Promo Code' box and when you submit the page the discount will automatically be deducted from the fares shown. If we have issued printed vouchers which contain a code, this code can ONLY be used when the printed voucher is handed in at the check-in booth on departure, as stated on the voucher. If you book using one of these voucher codes and do not hand in the voucher on departure you will be liable to pay the standard fare before the discount was added. We accept no responsibility for third party websites which publish voucher codes that have been taken from printed vouchers. You must have the original genuine voucher to accommpany the code, photocopies, reproductions and scans will not be accepted.